These days, cooking seems to be everyone's passion, as evidenced in part by the plethora of cooking shows on television and the internet. For high school students wishing to find their way into the restaurant industry, ProStart is a two-year high school program that puts kids into kitchens working with professional chefs and restaurateurs. In the process, the students get real-life mentored work experience not just in cooking, but also marketing, customer service, cost control, culinary techniques, and more. Beginning this week, The Utah Restaurant Association (URA) will hold its annual teenage culinary cooking regional competitions. The ProStart regional culinary cooking competitions will take place in Ogden on Tuesday, February 17th at Ogden High School, in Salt Lake City on February 19th at West High School, in Saratoga Springs on Tuesday, February 24th at West Lake High School and on Thursday, February 26th in St. George at Desert Hills High School. Thirty-four high schools will compete statewide in the 2015 regional competition and the 10 highest placing teams will go on to compete at the state competition and URA’s Food Service & Restaurant Industry Expo at the South Towne Expo Center themed “Taste Utah” on Tuesday, March 17, 2015. Under the leadership of URA president Melva Sine, Utah was the pioneer state for the ProStart program in 1996. This year the URA and its teachers trained over 1200 students. “ProStart is more than just a food course. 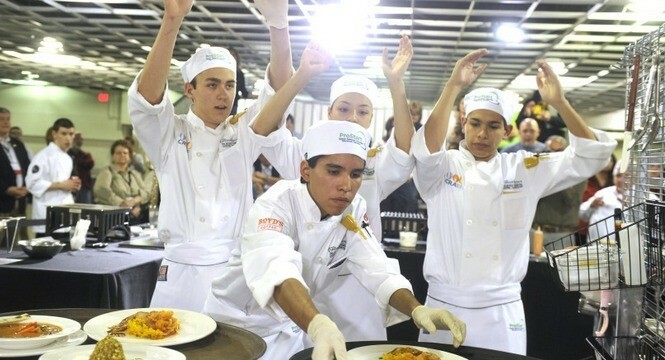 It helps inspire and educate our future generation of restaurateurs, chefs, managers, and culinary professionals. And these are really incredible teens.” says Sine. With rules and regulations as strict as a professional culinary institute, during the ProStart competitions three-course meals are executed by teams of two-to-four members with sixty minutes to prepare the meal to its entirety. All menu items are prepared using only one butane burner. No electric or battery operated equipment is allowed. The teen chef’s are judged by floor judges on knife skills, mis-en-place, molecular gastronomy, intelligent plating and food safety (just to name a few). The hand-picked tasting judges (including yours truly) are comprised of Utah chef’s, restaurateurs and industry professionals who taste anonymously and score innovative flavor profiles, according to very strict guidelines. The winning teams will continue on to the state competition March 17th 2015 at the South Towne Expo Center. Winners from state progress to the national competition April 18-20, 2015 in Anaheim, California. Both regional and the state competitions are open to the public.